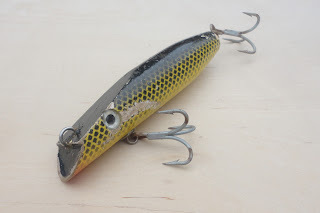 The Choopy darter was first designed because there weren't many darters currently made that were through wired at this size. It is 5" long, 1" in diameter and weighs 1 3/4 oz. Cast it out and give it a quick twitch to get it to dig in. It will wander from side to side in a slow, meandering, and unpredictable path that fish just can't stop themselves from striking. It can be a great"searching" plug because it casts well and covers a lot of water. While its easy to think that the darter isn't doing much because you don't feel it thumping like you might another plug, have faith in it. 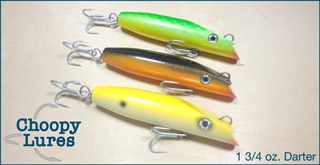 Fish it in calm water or moderate currents. When fishing it in calm waters, you might have to add more occassional twitches. Fish them for a while, and the fish will make them look like this!